Every year thousands and thousands of people from all over the world come to the Town of Ulysses, probably without even realizing it. In fact, just a few days before writing this, I met people from Virginia, Maryland, Ohio, New York State, and Canada in Ulysses. One time I met an entire busload of tourists from China. All these people were in Ulysses for the same reason--to see Taughannock Falls. What's so special about Taughannock Falls? 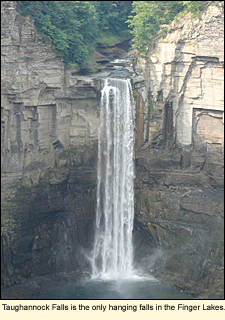 Well, it's just that, at 215 ft./65.5 m., Taughannock Falls is the longest free-falling waterfall east of the Mississippi River, longer by far than Niagara Falls, which is only 167 ft./60 m.
But Ulysses is more than just Taughannock Falls. Ulysses is a rural town in the northwest corner of Tompkins County. The eastern border of the town runs along the shore of Cayuga Lake. From that point, heading west, the land slopes up, eventually reaching a plateau (created by receding glaciers) between Cayuga and Seneca lakes. (In fact, for a great drive or bike ride, you can take State Route 79, which runs east-west between both lakes.) This plateau was once forested land and much of it still is. But today the land is dotted with houses and farms. It is here that on any Saturday afternoon in the late summer, you can find farmers haying their fields, vast fields of ripening corn 6 ft./1.8 m. high, and washing hanging on the line to dry. Ulysses, or Odysseus as he was also called, was the king of the Greek island, Ithaca, in the Ionian Sea. It's American counterparts--the Town of Ithaca and the City of Ithaca--are at the southern end of Cayuga Lake just a few minutes' drive from the Town of Ulysses. Like other towns in the region, Ulysses started out as a number of small hamlets and loose communities, including Willow Creek, Jacksonville, Krums Corners, Halseyville, Waterburg, and Podunk. (Yes, there really is a place called Podunk.) Many of these hamlets settled around parts of Taughannock Creek, a large, multi-branched creek whose water provided power for saw, grist and other mills, including a silk mill. Today, all of these hamlets exist in name only except Waterburg and Jacksonville. Apparently the Cayuga Indians had a fort in a wooded area off Indian Fort Road until they were driven out by General John Sullivan's army. The first American settler was Captain Jonathan Owen. (It was common for soldiers who had routed out the Indians and sent many of them to starve to death at British-held Fort Niagara, to take over the land the Indians held.) Owen ran mills on Taughannock Creek. 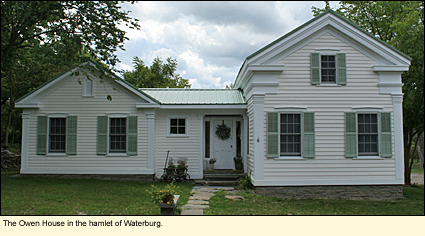 His home, beautifully maintained with a 3-hole outhouse in the back, sits on a rise near the intersection of Waterburg and Indian Fort roads. The mills along the creek across the road are now gone, but the current owner of the Owen house claims the creek is great for swimming. Jacksonville has very little to remind one of the past, put it does have a small community of houses, with a gas station, a post office, a lovely church, and the Glass Horse Art Studio and Gallery. Town of Ulysses resident Judy Cone has taken on the project of renovating a building, now called Ulysses Square, using "green" technology. Strategically located on State Route 96, Ulysses Square is now available for office space. So, the hamlet may be on its way to a bright future. 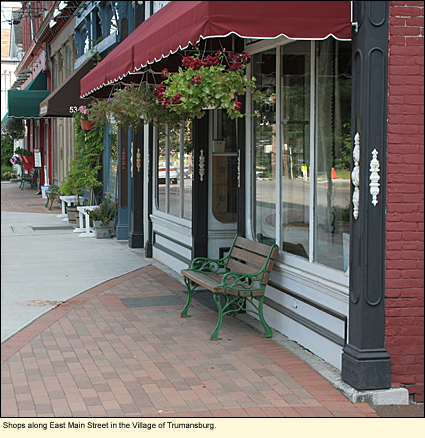 The only other active community in the town is the Village of Trumansburg, which is really the center of most of the action in the town. Located on State Route 96, it was first settled by Abner Treman (variously Tremaine), who rose to the rank of sergeant major during the Revolutionary War and was awarded the Badge of Merit for his faithful service. Like Owen, he served under Sullivan, and came back to claim his booty--600 acres--where he established a grist mill on Taughannock Creek at the point where it intersects with what became the Ithaca-Geneva Turnpike (now State Route 96). A thriving community called Tremaine's Village developed. 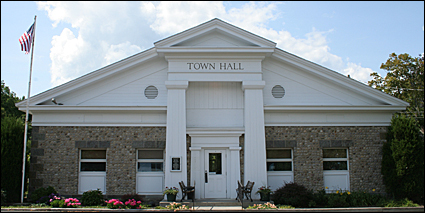 Treman applied to become the village's postmaster, but due to some error, perhaps a misreading of Treman's writing, the village name was listed as Trumansburg, and that name has stuck to this day. Treman went on to have a number of descendants who played a major role in the growth of the county, including Robert H. Treman and Allen H. Treman, for whom local state parks are named. 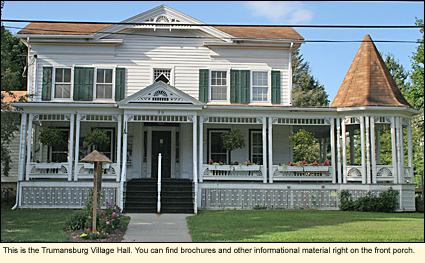 Unless you're starving, and there are a variety of eateries in the village, the first place you should stop is the lovely 1820s house at 56 East Main Street that is the Village Hall. On the porch near the front door are racks of brochures, including one produced by the local chamber of commerce that includes a map of the village. Most of the shops are located on a .5 mi./.8 km. stretch of Main Street. There is public parking along the street and also on Elm Street. You can take a leisurely walk along Main Street and stop in the shops. There are also a few here that you may want to scope out for some evening entertainment. Benches are everywhere, beckoning you to sit and stay awhile. Also on Main Street at the corner of South Street is the Ulysses Philomathic Library. (Philomathic means "love of learning.") The Town is justifiably proud of this lovely new structure and all the services it provides to residents of the town. 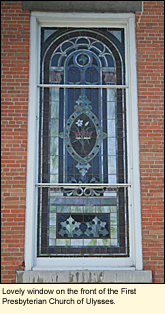 Depending on your interests, you may also want to take a look at the lovely cobblestone work on the Ulysses Town Hall on Elm Street and the Episcopal church across the street. 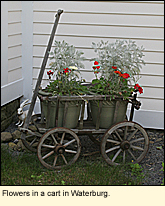 At 16 Elm Street is The Art Gallery at Juniper Hill, which specializes in Impressionist art. At 39 South Street is the museum of the Ulysses Historical Society. The museum contains many interesting artifacts and bits of memorabilia relating to the town. Its docents are a wealth of information and demonstrate the friendliness that pervades the town. 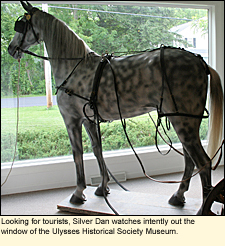 They will be happy to tell you the story of Silver Dan, who takes pride of place in the building's picture window. You may notice that the sidewalk-less side streets in Trumansburg are narrow, paved, two-lane roads that many of the locals tend to use as walking, jogging, and biking paths. Feel free to do the same. The village has many lovely old homes and gardens on cool, shaded streets, waiting for you to explore. Congress Street is such an example. Here, at the corner of McLallen and Congress, you will find the Trumansburg Conservatory of Fine Art, a impressive Greek Revival structure built in 1851. 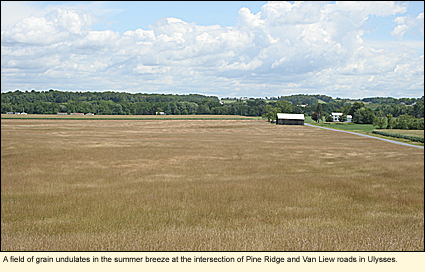 Just east of the village of Trumansburg is the Henry A. Smith Woods, a 32-acre parcel of land donated to the village. Although the woods is maintained in a natural state, it does have an unmarked but well-worn trail through it. In the summer, the leaves from the trees can provide quiet shade. Birding is probably most fruitful in the spring. Smith Woods is managed by the Cayuga Nature Center. 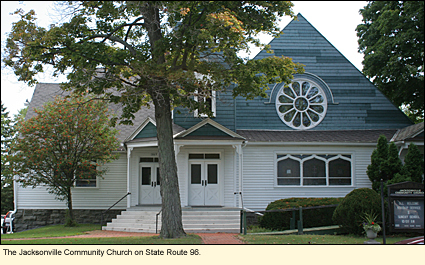 The Center owns 75 mostly wooded acres on State Route 96. 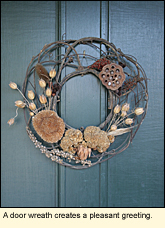 You can hike the trails, watch for birds and other wildlife, and find a wide variety of wildflowers and fungi, as well as attend seasonal programs and events. Another good place to watch birds is along the lake shore in Taughannock Falls State Park. Here, especially during fall migration, you may find a large number of loons and other waterfowl. In the village of Trumansburg on Halsey Street is the 18-hole Trumansburg Golf Club, and several miles to the east of the village in the Town of Hector is the Finger Lakes National Forest, criss-crossed by a number of hiking, biking, and horseback riding trails. In the winter, this is a great place to go cross-country skiing. If music is your thing, you'll want to make sure you visit Trumansburg in July for the Finger Lakes GrassRoots Festival of Music & Dance. This is a 4-day affair with more than 60 bands. Finally, the jewel in Ulysses' crown, as already mentioned, is Taughannock Falls State Park and everything it has to offer from swimming and boating facilities to concerts by the lake. In the winter, there is cross-county skiing, ice skating, sledding, and hiking on a select number of trails.